Ranau volcano is a 13 km x 8 km caldera partially filled by Lake Ranau. (Danau Ranau). 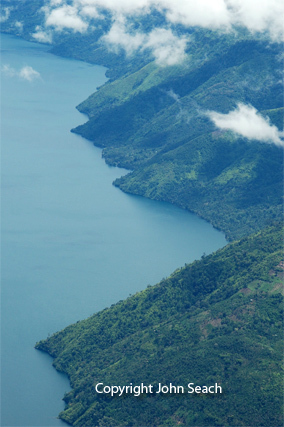 Lake Ranau is located in Banding Agung district, 125 Km from Baturaja. The lake is 300 m deep and is a popular destination with locals in Southern Sumatra. The volcano lies along the Great Sumatran Fault. Gunung Semuning, is located on the SE side of the caldera at a height of more than 1600 m above the lake.